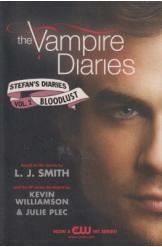 The Vampire Diaries Stefan's Diaries Volume 2 Bloodlust, based on the novels by LJ Smith and the TV series developed by Kevin Williamson and Julie Plec, 225 pages. The book is in a very good condition, all pages intact. The book reveals the truth as to what happened between Stefen, Damon and Katherine and the Vampire Diaries love triangle began.